Frank Fidler (1910-1995) was born in London and wanted to pursue a career in painting from a young age. However, due to a lack of encouragement from his father, he worked as a nurseryman in Herefordshire instead, before opening his own greengrocers shop in Waltham Cross in the 1930s. Fidler began painting again in 1947 and eventually sold his business to pursue painting full time. His early works were figurative in style and he held successful exhibitions for these works. However, in the 1950s when the influence of action painting was spreading to England, and after a chance encounter with Jackson Pollock, Fidler's style moved dramatically towards the abstract expressionist. Fidler took part in his first major exhibition in Moscow, 1975, alongside other British artists and the following year was included in the Paris exhibition 'Towards the Future.' In 1959 Fidler had his first solo show at the Drian Gallery in London and subsequently began exhibiting there regularly. 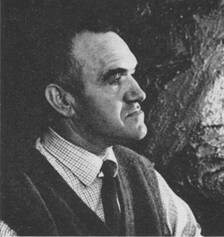 During the 1960's he also exhibited in London with the Free Painter's Group and the Ben Uri Gallery. Fidler continued to paint for the rest of his life, however by the early 1960's he moved away from London and by the 1980;s he had completely abandoned abstraction. He began to record the landscape around his home and on his travels in watercolour, pastel and graphite. His figurative work nevertheless retains the energy and bold visual appeal of the abstraction of his earlier years.